Everyone has limitations — work out what yours are when you are building your site. Do you have a budget for the build, and if so, how will this limit what you can do? What technical limitations do you have? Is there any part of the build that you won’t be able to do by yourself? How does the technology limit your build? You can do nearly anything with enough hard work, but remember that not everything will be possible. Do You Have All the Tools You Need? It depends on how much of the build you are doing, but you will probably need graphic editing software (i.e. Photoshop, Fireworks), a web development application (i.e. Dreamweaver), e-commerce and online store management software (i.e. Magento, OSCommerce, etc.) and the obvious things like a domain name and web hosting. What E-Commerce Platform Are You Going to Use? Since we are talking about e-commerce, we should take into consideration what’s going to power our website. There are countless of e-commerce platforms out there, and one of your tasks is to find one that fits your needs. Depending on your knowledge and what your needs are, there are a various number of options that you would be able to use. If you think that you have quite a comprehensive knowledge on the subject, then maybe you should consider going for an open source cart or even building a platform yourself. If not, then there are also hosted carts to take into account. Let’s have a look at a few platform options from different categories. Magento is probably one of the most popular open source carts in the e-commerce platform market and, in my opinion, is probably the best free cart out there (there are also enterprise and professional versions with a yearly cost that will provide additional support). Magento has some awesome features including analytics integration, capability of wish lists, multiple images for products, advanced product filter search, advanced customer service, tonnes of payment methods, marketing/promotional tools and so much more. 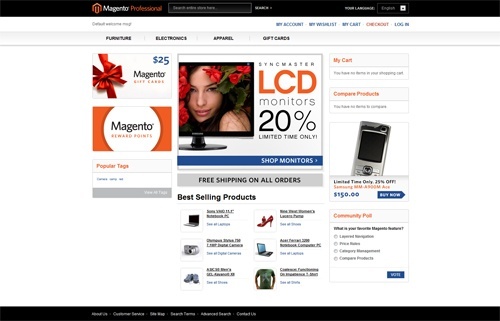 Recently, Magento has also released the world’s first mobile commerce platform. This could be very interesting, even more so now that smartphones with huge screens (such as the iPhone) are all the rage. Shopify is a very interesting hosted platform. Compared to something open source and self-hosted like Magento, it is extremely simple to set up, manage and update. You could have a site running within minutes if you wanted to. But Shopify does have a slight lack of features (by intent — to keep things simple), its price is a monthly fee plus, on top of that, a commission for every sale, and a hosted platform means you have less control of your platform (which isn’t necessarily a bad thing for people who just want things to work). Another alternative that has recently arisen is that of WordPress, Drupal, and Joomla! 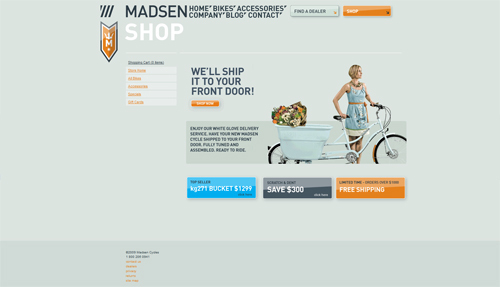 shopping cart plugins, giving these content management systems e-store capabilities. There are a few, including eShop, Shopp, and WordPress MiniCart. This is great if you want a quick add-on for you existing site, but not perfect if you want a fully manageable e-commerce site. An alternative to all this would be to go the DIY route and build your own platform. Of course, this will need a fair bit of web development knowledge and also a lot of time. But putting in all that work could be worthwhile if you have highly customized needs. Plus, if you build it yourself, you’ll be guaranteed full ownership of everything, including your code base. Do a little bit of research into what other e-commerce sites are doing right and wrong. Try to learn and consider all your findings when you’re building your e-store. Let’s have a look at some of e-commerce sites. 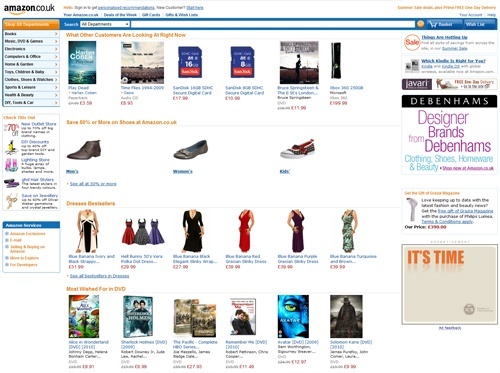 Amazon is the world’s largest online reseller, but what makes the site so brilliant? One of the main factors is the simplicity of the site: Even though it looks cluttered, it’s still easy to navigate and find what you are looking for. For example, think of any product you want to buy right now: You’ll probably find it or learn that it isn’t available on Amazon.com within three clicks. Amazon also boasts about its customer service and if your customers are happy, then you’re doing a good job. Other huge e-commerce sites you should look at are Zappos, Threadless, and ThinkGeek. Google Product Search is not really an e-commerce site, but it’s worth looking at to illustrate an important concept about planning and building e-commerce websites: simplicity is important. And if we can think of one company that excels in this concept that best, it’s Google. Google has been known for its simplicity since the beginning and this remains the case when using its product search. Google Product Search is also great for when you have your e-commerce site up and running as well: By uploading a list of your products to Google Product Search, you open a whole new portal to your online shop. Another remarkably simple but successful e-commerce site to look at is Woot. Now that we’ve had a look at the largest, let’s have a look at some smaller e-commerce sites. 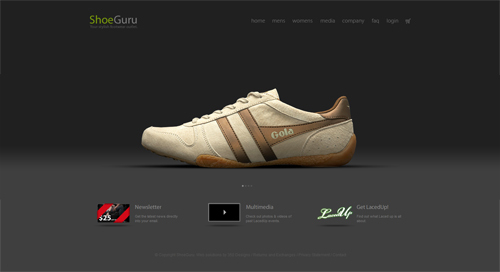 ShoeGuru is an amazingly simplistic site, and its design is perfect for displaying their clothing products. The design comprises of a nice graphical site that gets the message across. 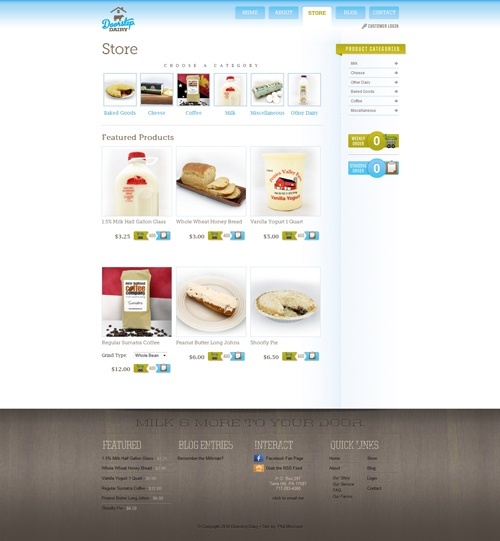 Doorstep Dairy is a great example of a great-looking site that is both fun to use, yet still easy to purchase from. 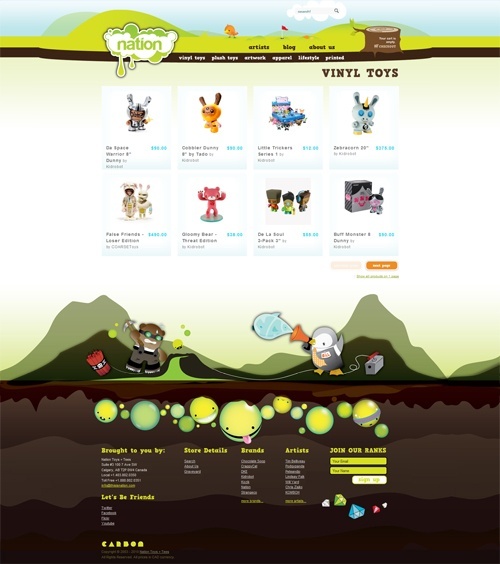 Nation Toys is an excellent and colourful site that compliments the vibrant products they sell. 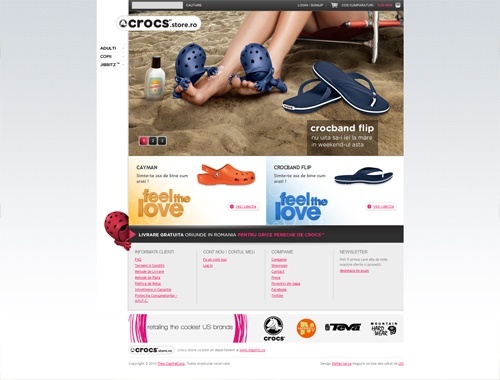 Crocs Store Romania is probably the best version of the Crocs site (for some reason they have designed the sites differently for each region). Once you’ve done your planning, what do you do next? Well, everyone works a different way, but you may want to make a mock-up or wireframe of what your site will look like. Some people like to go straight into Photoshop or other design software at this stage, but personally I like starting out with pencil and paper (very old fashioned, I know) because it’s easier for me, but it may be different for you. If you do decide to start out the old-fashioned way, try Paper Browser: You just print out the templates and draw on them, giving you a true perspective on paper.